While I’m off at the last of the three conferences in four weeks (actually I’m running the Boulder Business Retreat), I thought I’d share this little example of what not to do with your email marketing. I should be back more regularly next week; I hope you’ve missed me as much as I’ve missed you! Today’s shining example of a company that just doesn’t get it is AmericaRX (http://www.AmericaRX.com/). I recently decided to purchase something from them, as they had the best prices available, for a fairly hard-to-find item. Of course, I had to create an account in order to make the purchase. Issue #1: Forcing a squeeze play under the guise of “an account”. Because that’s basically all that it was. In creating the account, of course the “send me your promotional mailings” box was pre-checked. Issue #2: Pre-checking the “send me your promotional mailings” box. Bad practice – the opposite of best practices. Of course, I unchecked the box. Very carefully. 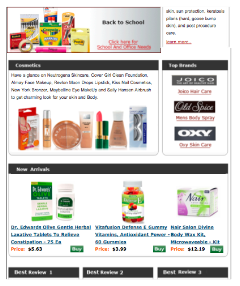 Nonetheless, within 5 minutes of completing my order, I got an email with 3 pages of HTML advertising from AmericaRX.com. The ad came ‘from’ “promotions@americarx.com, which apparently goes to a black hole (we’ve tested it). And then, get this! Remember how I’d specifically unchecked the “send me your mailings” box? Issue #4: I bloody well did not join your newsletter program. At least, not willingly. Bonus Issue #4.5: The newsletter was from July! They not only spammed me, they did it with something 2 months out of date! To an address that they shouldn’t have mailed in the first place. Issue #5: I can’t even opt-out of their mailings! (And let’s face it – I shouldn’t have to.) Because they provide NO OPT-OUT INFORMATION! “We hope you find AmericaRx.com helpful in managing your everyday health care needs. If you have any questions or need assistance, please contact us by e-mail at customerservice@americarx.com, or call us toll-free at 1-877-932-2979. No instructions for unsubscribing at all! How a supposedly legitimate Internet-based company, in 2008, can still not comply with the most basic requirements of CAN-SPAM is beyond me. Issue #6: They are not compliant with even the most basic of CAN-SPAM requirements, let alone the “one-click unsubscribe” requirement that went into effect this summer! You can check out the actual email they sent below. 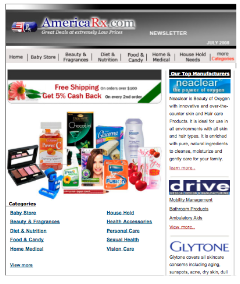 AmericaRX.com – this week’s poster child for how not to send commercial email. See you next week, when I get back from the Retreat! P.S. If you didn’t see it yesterday, check out our exciting new Email Sending Secrets Insider’s Circle! Next: » Wow! I Hit the Trifecta of Online Media Exposure Today! I agree with the above mentioned msg. There is fraudulent activity happening, I have not received my order & its been over 2 weeks. Something was shipped because there is a valid tracking # but at the same time it seems the package is lost and AmericaRX says there is nothing they can do. The package apparently was processed at a postal facility in my city on February 12th & now February 23rd & I still don’t have it. I was in the shipping business for 3 years & know when a package is lost the only way to find it is if the sender (AmericaRX) opens an investigation with the shipper (USPS). So there is nothing they can do right? I tried calling the 3 toll free numbers provided & all 3 are out of service. I finally found 3 other numbers which also indicate are toll free but I know they are not & after being on hold for over 5 mins, I spoke with an agent who was uninformative, refusing to speak with USPS. Ive sent emails & not one response yet. My last resort was to try live chat where again I got the runaround. I will be contacting the bank & credit card company as well as filing suit with the Better Business Bureau! I never received my order. I still have not received a refund even though they said I would THREE DIFFERENT times. I have to contact the better business bureau, my bank and next the courts. This company is horrible!!! They do not care about their customers. They do not have a support line, just a sales line. They do not reply promptly to inquiries or issues. They will not save you money. They are rude and mean. They are mostly in India with a shipping depot here in the US. 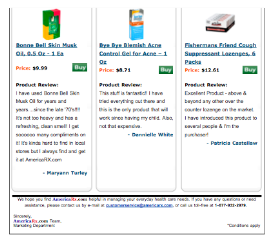 Greetings from Americarx.com Am glad you did this review. After finding this we rectified the technical gap you mentioned. I appreciate you can re-check every step of the process you mentioned and update the article. Also we are noticing your good review about the pricing. This will greatly help our website to remove the Bad Opinion [because of technical glitch] from this article. I am personally saying sorry for the inconvenience caused by this entire spam issue. We fixed it now.